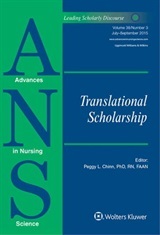 Today we released ANS 38:3, which features articles on the topic “Translational Scholarship” as well as two “General Topic” articles! 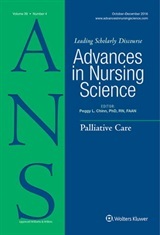 I am particularly excited about this issue because it contains ground-breaking information that has real implications for both nursing practice and nursing knowledge development. Please take a few minutes to browse the Table of Contents. I am confident that you will see something in this issue that you will want to read, and/or share with someone you know! Thanks to all of the dedicated scholars who contributed to this issue. As with most issues of ANS, the authors include some well-known scholars whose work is already widely recognized for its importance to the discipline. But there are also authors who are early in the development of their careers and whose work promises to become increasingly valuable as they move forward. As always, we would love to hear from you about this issue. Each article will be featured here on the blog, with a message from the authors, over the next 12 weeks. Remember, while each article is featured it will be available for download without charge! If you want to be notified when this happens, just subscribe to this blog, and an email will be delivered with content from the featured blog post!